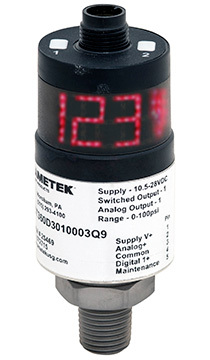 The Model PST360 is our first pressure switch and pressure transducer in one. This unit is field-programmable, with an integrated 360º display for easy viewing at a distance. The bi-color LED display can scroll 360º or you can lock the display in one location. The PST360 comes standard with one digital and one analog output, and available in pressure ranges up to 10,000 psi.